Himalayan blackberry is an introduced invasive species of Rubus that originates in Armenia. It was introduced to Europe in 1835, and Australasia and North America in 1885, for its fruit, but soon escaped and naturalized (Wikipedia 2010). It is now present in most of temperate regions of the world. In North America, Himalayan blackberry is found in many US states (USA (AL, AR, AZ, CA, CO, DC, DE, HI, ID, IL, KY, MA, MO, MT, NJ, NM, NV, OH, OR, PA, TN, UT, VA, WA) and two Canadian provinces (BC, ON) (USDA 2010). It appeared in BC in the 1970's and was collected by Brink and McHale in 1973 in Pitt Meadows (UBC Herbarium record, V178889). In the lower Fraser delta this species forms thick hedgerows along fields and waterways, and provides 'briar patch' shelter for feral domestic rabbits. It is an ecosystem altering species that disrupts natural systems. View the animated distribution map for this species, showing distribution change over time in British Columbia. Alternate, evergreen, palmately compound, 5-20 cm long; leaflets 5 on first-year canes, mostly 3 on flowering canes, egg-shaped, 5-12 cm long, double-saw-toothed and abruptly sharp-pointed at the tip, green and smooth above, greyish-woolly beneath, the leaf-stalks and midveins beneath prickly; stipules linear. Inflorescence of 5 to 20 stalked flowers in open, terminal or axillary clusters, the stalks woolly and prickly; corollas white to pinkish, the petals 5, spreading, egg-shaped, 10-15 mm long; calyces woolly, 5-lobed, the lobes lanceolate, bent back, 8-12 mm long; ovaries superior; stamens 100 or more. Drupelets, smooth, coherent in a black nearly globe-shaped cluster that falls with the fleshy receptacle (a blackberry), the berries 1-1.5 cm wide. Moist to wet waste places, roadsides, ditches and fencerows in the lowland zone; common in SW BC; introduced from Asia. Control of Himalayan blackberry can be achieved by digging, mowing or herbicides. One novel approach to control is livestock grazing, particularly by goats--a method that is widely used in Australia and New Zealand to control blackberry (Cox 2003). Goats remove the top growth of the plant, eventually killing it. Research has shown that Himalayan blackberry occurs in soils that have more sand than clay present (Caplan and Yeakley 2006). This species is listed by the Greater Vancouver Invasive Plant Council as one of the top twelve most problematic species in the Vancouver Region. For more information, visit their web site. Cox, Caroline. 2003. Nonchemical methods for removing unwanted blackberry plants. Journal of Pesticide Reform 23 (1): 10-11. Caplan, Joshua S. and J. Alan Yeakley. 2006. Rubus armeniacusOccurrence and Growth in Relation to Soil and Light Conditions in Western Oregon. Northwest Science 80 (1): 9-10. USDA. 2010. Rubus armeniacus. USDA Plants Database, United States Department of Agriculture. Available Online. Wikipedia. 2010. 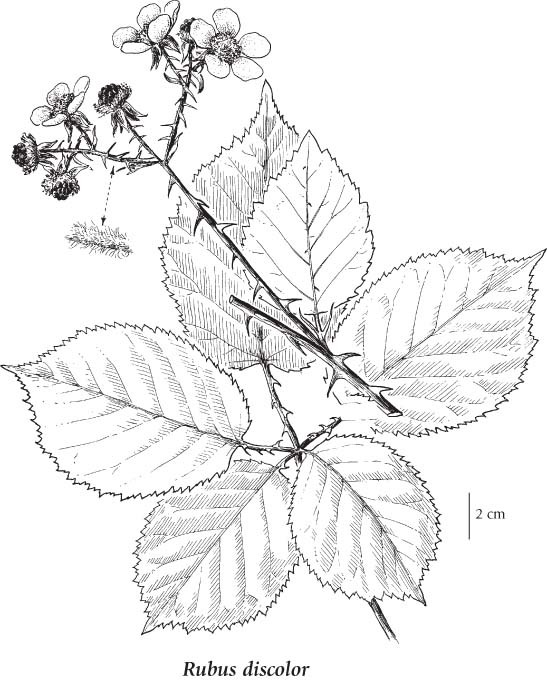 Rubus armeniacus page. Available Online.